In Salesforce Chatter Group represent a group of users. It’s a great way to boost collaboration in your organization. After Spring’15 release it also allows users to add a record in Chatter Groups, it means users can collaborate on and discuss the records as a team in the group. Users can only add Account, Contact, Contract, Campaign, Case, Lead, Opportunity and Custom object records to groups. 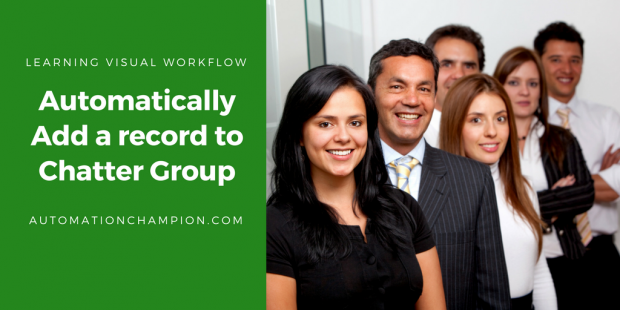 Chatter Group that allow customers and groups in communities don’t support records in groups. Higher management in Universal Container wants to a develop an automated process, so whenever an Opportunity is created in the system with an amount greater than $100000 it will automatically add Records to Chatter Group (Universal Container Internal). To solve this requirement we will use Visual Workflow, Process Builder to fire Flow. Before proceeding you have to understand CollaborationGroupRecord objects in Salesforce. 1. CollaborationGroupRecord: – This object represents the records associated with Chatter groups. CollaborationGroupId represents ID of Chatter Group and RecordId rrepresentsID of the record associated with Chatter Group. Before proceeding ahead create a Chatter Group (Universal Container Internal) and copy Chatter group ID. 5) Save the flow with name (Add records to Chatter Group) and Close the canvas. 6) Don’t forget to Activate your flow. 5) Click on Save and activate it. Do you know if we can also include notification to group members when this happens? We haven’t seen a way to do it other than post a separate message to the feed which seems slightly redundant. It’s possible but in some scenario it may hit the governor limits. So best approach is to post a separate message to the feed. You mean to say summation of Opportunity Products amount to Contract Amount field ?